“It was 1985 and four of my mates and I were heading out for our annual tuna fishing trip on the Easter long weekend. We left Hobart at midnight and headed towards Tasman Island, South East of Port Arthur. It was cold and dark and a storm was brewing. Dark clouds made it impossible to see anything out on the water. We were about five nautical miles from Port Arthur when my boat’s motors became entangled in four or five surface marker buoys attached to lobster pots. It was so dark, we had no idea they were there. At the time, I was up on the fly bridge with two others and we were practically blind in the darkness. The boat was disabled and turned sideways into the crashing waves. We were all thrown off our feet and anything not bolted down was flown around the boat. For a minute it was complete chaos and disarray. The boat was rocking uncontrollably and we were edging closer to the rocky cliff face of the Tasman Peninsula. Luckily we managed to get one motor free and running again. We slowly made our way to Port Arthur and safety, where we moored for the night. The next morning we dove under the boat to disentangle the remaining motors and continued on our fishing trip. For the next four days I couldn’t focus on fishing, but could only think about how the incident could have been avoided. We were extremely lucky no-one was hurt or even killed – all because of a few seemingly harmless lobster pots and their surface markers. After racking my brain for three days I concluded: if the buoys had been submerged underwater, this wouldn’t, and more importantly couldn’t have happened. Why had no-one thought of this before? I had read numerous times about boats capsizing and people drowning from motors entangled in fishing gear. After returning home from the trip, inventing a solution to the problem slipped to the back of my mind. It wasn’t until four years later I started thinking about it again – seriously. My mind kept returning to the idea of an underwater yoyo. 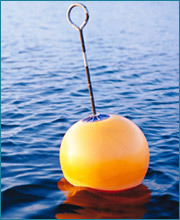 Not simply a pop up buoy or a smart buoy, but a buoy that could go down and come up. I realised there was definitely a need for such a product and set about inventing it. I was testing a prototype in Hobart’s Derwent River in 1995 when I was spotted by some Australian Navy divers. They immediately recognised applications for my invention in the defence industry. And it was with the help of the Australian Defence Department that the Fiobuoy, the world’s first submersible marine marker buoy and retrieval system, was developed”. Click here to learn more about the Fiobuoy, or fill out an enquiry form to discuss an underwater recovery solution with us.